Data aggregators run the world of local search. They supply information to major search engines like Google, which means that having accurate business listing info on data aggregators ensures all is right on Google. These aggregators have built massive business databases from valuable listing sources like yellow page directories, phone directories, utility records, and various online information providers. They’ve got an unbelievable amount of business data that search engines use when looking for businesses’ local listing information. There are four major data providers: Factual, Acxiom, Infogroup and Localeze. Their databases contain business information that search engines seek out to display for consumers. This information is the basis of where many online citations come from. What exactly is a citation, you ask? Citations are when a business is mentioned somewhere online, and the more citations a business has generated, the more likely their business is to appear higher in search rankings. These online resources are only a few of the sources that receive data from the data aggregators. Obviously, sites like Google Maps, Facebook and Yellow Pages are crucial places to be listed for businesses that want to be found online. Businesses need to get their information correct with these data providers, or they risk not being found by potential consumers. Every business wants online visibility! Do you want to master SEO with all of the major data aggregators, and generate and as many business citations as possible? I thought so. Though any of these combinations is considered a citation, a citation is not considered to be complete unless it contains the company name, address and phone number (NAP). Businesses who have their NAP data correct with the major data providers have a better chance of seeing their correct information appearing all across the web. A structured citation is the most common type of citation, and usually the most detailed when consumers are looking for business information. People see structured business citations on business listing sites like Yellowpages, Yelp or TripAdvisor. In most cases, these citations contain the NAP for a business, something consumers are looking for in local search. An unstructured citation can be found on random websites, blogs, event listings, job posting sites, government records or social media mentions. These are unstructured because they could be as simple as a company mention. Usually these citations don’t include a business’s NAP data. No matter how a citation appears, it has influence on the local search ranking in some way for a particular business. Data aggregators play an important role in getting a business listed or found on many major websites. Why Is It Important to Build Citations? Citations have a major influence on local search rankings. Basically, the more times a business is mentioned online, the better chance their business has to rank near the top of local search. Google’s search ranking algorithm has many moving parts, which means that citation building isn’t the only thing a business has to do in order to rank on search engines. Online reviews, mobile compatibility, domain authority and keyword density are just a few other factors that influence local search. This doesn’t mean that citations don’t play an important role in local search ranking, though. In fact, David Mihm’s local search study suggest that citation related factors are very important: they make up 25% of the top twenty factors the influence local search. What Do Data Aggregators Do? Data aggregators provide a lot of the data to search engines when conducting a local search. 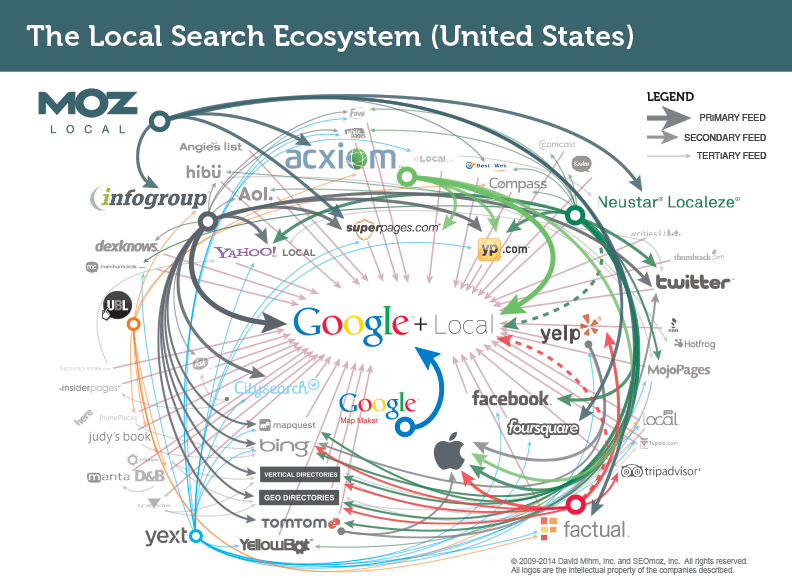 The aggregators own the space known as the local search ecosystem, a place where local searches get all of their data. There you see the four major data aggregators: Infogroup, Acxiom, Localeze, and Factual. As you can see, many major directories and listings sites rely on these data providers for their information. Like we mentioned earlier, the data aggregators are the foundation of what builds structured citations on major sites. Although the picture might seem like a lot to comprehend, the underlying message that you should take away from this is really simple: get business data right with the major data aggregators. Incorrect data on any of these aggregators could mean that a business’s information online is extremely inconsistent or down right wrong on many major listing sites and directories. Inconsistent information hurts SEO, so be sure to have your business correctly listed with all the major players. Business citations rely on the power of data aggregators! We see that data aggregators have a major influence on the amount of reputable sources that a business is cited on because they automatically input business data into various sources for a business. This means not having to manually plug in information into each and every business-relevant site on the worldwide web. There is no secret that we are keeping from you, or a fancy trick to increasing online citations. It’s as simple as getting it right with the major data aggregators. Local search is a major deal for businesses, especially for small businesses. A company could potentially force themselves into bankruptcy if their online visibility is non-existent. Consumers rely on the internet and search engines to interact with local businesses. According to Google, four in five consumers use search engines to find products, services or experiences nearby. These are searches for anything, from the best pizza in town to the fastest hair salon. Local search is what drives consumers to a business’s front door, and ultimately drives top-line revenue for local business. Make sure that your business gets it right, and isn’t missing from vital local search results. Start using data aggregator: it’s the first step in building accurate online citations and mastering local SEO.